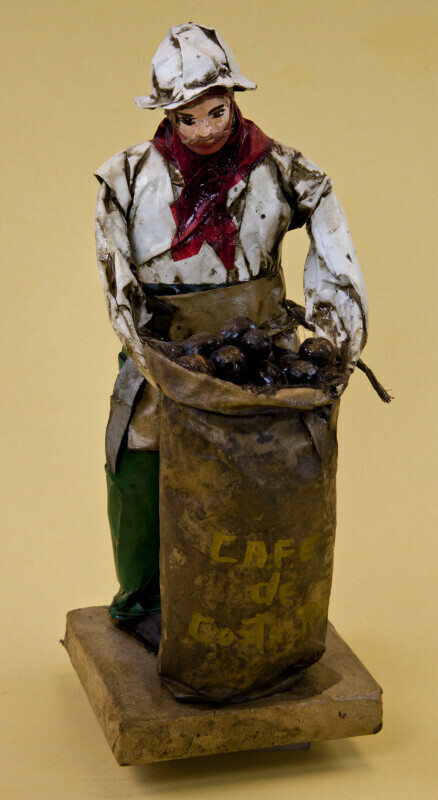 Beautiful hand-made papier maché sculpture of a man standing by a large bag of coffee beans. The Costa Rican man is wearing a hat and red scarf. He has a white shirt and green pants. The words, "Café de Costa Rica" is painted on the front of the sack. On the bottom of the wood stand, it says “Hecho en Costa Rica.” The figure stands 9 inches (23 cm) tall.